A few years ago I went out with a guy who made me dinner in his apartment. I’m going to refrain from saying what I thought of the food. But at the end of the meal as we brought the dishes into the kitchen, I noticed that his dishwasher had a unique design that I’d never seen before. Though I didn’t even have this blog at the time, I took some photos knowing that one day I’d want to share them with the world. What I thought was so cool about the dishwasher, a Whirlpool Quiet Partner I, was that the utensil tray sits on the door instead of where you normally see it, on the side of the bottom rack. This leaves more room for dishes, and skips the step of having to pull open the rack every time you need to throw in a piece of silverware. In this position gravity helps keep the silverware from shifting around every time you open the door, but it does kind of block your access to inserting or removing dishes from the bottom rack without having to pull it open. I suppose that’s why this guy kept his attached to the door. Anyone out there ever seen one of these? What position did the owner keep the utensil tray in? The idea that Whirlpool wanted to try to innovate in this area is interesting to me. Do you guys think it was a success? That is pretty awesome. I've never seen them either, but I'm wondering why we don't see more of this type. Certainly more usable, though the cost might go up a bit for more materials. I have that dishwasher & actually am really happy with the utensil tray for the reasons you stated. I leave mine attached to the door. I didn't actually know it could attach to the bottom rack like shown, but I like mine where it's at. I also think it's great that the utensil rack opens via the little blue tab shown in the first picture. Easy access to get stuff out when it's all clean. I've had this dishwasher for about a year and a half and never knew the utensil tray could be attached to the door. When I moved in to my apartment, the tray sat at the end of the bottom rack and until just now, when I ran into the kitchen and moved it to the door, I never knew it could fit anywhere else. Since I can't speak for how the utensil tray works on the door, I can tell you that it doesn't always work very well sitting on the edge of the bottom rack. It's supported by two short little arms, so sometimes removing a bigger utensil from the tray can nudge it just enough to make it fall off the bottom rack. And while spilling a few forks onto the floor of your dishwasher is no big deal, knowing the tray is capable of falling pretty easily has made me approach my utensil tray with an odd level of caution. I'll keep track of how the utensil track works on the door. I should not be as excited as I am, but hey, the dishwasher does a new trick! Hooray! change with the utensil tray attached to the door. We have one of these attached to the door & every time you remove the clean utensils there is food caught behind the holder. Thanks so much for the tip ours is now on the front of the lower basket!!! Removing the utensil tray offers the user nearly unfettered access to the entirety of the bottom rack's real estate. It doesn't much affect things when you're dealing with dishes only, but attempt to wedge a roasting pan in there while trying to negotiate the utensil island conveniently placed in the middle. Good luck. Like tehawesome, I've also had this dishwasher for a while and never knew about the “hook it onto the lower rack” feature. Just goes to show you how important design affordances are. I have it too. Didn't know it could hang on the rack. I'd always been jazzed about the fact that, once everything's clean, I could just pull the entire container-full of silver out; put it on the counter above the silverware drawer and make a quick transfer. Got one over a year ago. Love it. Can fit lots more than my old dishwasher and the utensils actually come clean. we have one very similar to this, too. even better than saving room is the ability to take the silverware container with me around the kitchen as i put away silverware, baby spoons, & other utensils in various corners of the kitchen. a downside: if i want to unload the silverware last & i leave the container in place, the water still left in the dishes will fall directly onto my clean forks & spoons. i've never thought to hang it on the front of the bottom drawer; i'll have to look into that. Here in New Zealand we're (well, at least I am) pretty proud of a company called Fisher & Paykel who make some pretty innovative products. One is the Dish Drawer which instead of having a door that folds down and trays you pull out just has two independently operating draws that can be stacked on top of each other or side-by-side. 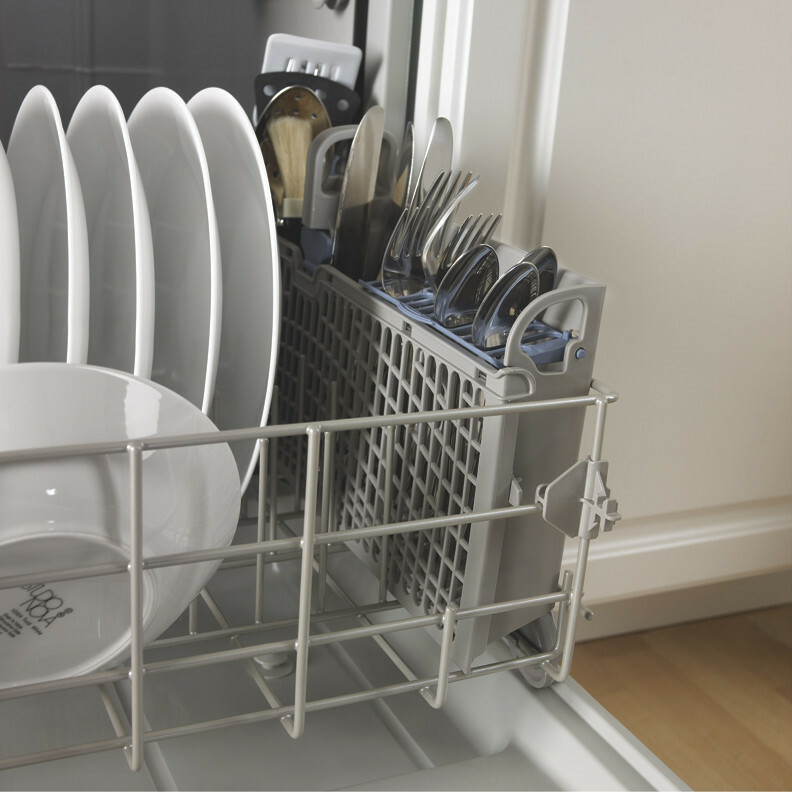 This allows you to run a half wash that saves water and power, and in my opinion is just easier to use and avoids the flimsy trays you often get on dishwashers that fall off their rails. Hmmmmm, just bought one of these dishwashers used… installed it and was griping about the floppy utensil tray that didn’t seem to fit anywhere! Googled images to see if I could figure out how old this dishwasher was, and saw your post. So, the tray goes on the door or exterior shelf huh? Cool! I had this dishwasher at my last house and we really liked it. The only issue was the plastic tab on the utensil holder broke, so we flipped the bale without it. When we upgraded to stainless, I just bought a new front panel and control panel for way less than a new dishwasher and installed them myself. Does Whirlpool still make these? I’m looking for one for my current house. We have had this Quiet Whirlpool for years and love it except that there is always water on the door behind the silverware tray when the drying cycle is finished. Some of our stainless utensils have rust spots from the excess water. Thanks for the tip to hang the silverware basket on the lower rack. We will try it. It takes 2 hours to run a load. Does everyone have this problem? Thanks! Your photo helped me put the blue tab on the silverware basket back on. Don’t know what made it come off. But fixing it was easy once I knew it is up when closed as in your photo. I keep the basket on the door by the way. And I do like the feature. I remove it full of clean silverware when sorting the clean ones back into the drawer. Also when loading a bunch of dirtys. For a few, I just leave it on the door. I know I’m a little late to the game here but I’ve had this dishwasher for 6 months now (since i moved into this apartment) and the rack has always sat on the door. I found this so so annoying because I had to shut the drawer with the plates in it just to drop a fork into the silverware basket while cleaning up dishes. I never knew it could hang from the drawer like that. I was actually googling for an alternative basket, the kind that sits in the drawer when I found this blog entry haha. Thanks so much for posting! The BIGGEST mistake whirlpool made was taking the utensil basket from the door. 30 years with one on the door and now?? I have had two different Whirlpool dishwasher with this door-or-bottom-drawer utensil tray feature. Yes, mounting the rack on the door normally makes a little more room for things in the rack but the way this one is designed, it doesn’t matter. The nice thing has been that you can simply lift the rack out and take it over to your silverware drawer to unload. Couple of bad things, though. First, a fully loaded silverware rack makes the door too heavy and it will drop like a rock, even if you have the counterbalance springs set to highest tension. Somebody else mentioned that it is difficult to load in the door when the door is open. Another issue is that, depending on what you put in the rack, when you close the door, the utensils may shift, blocking the washing spinner under the glass rack. When that happens, dishes are still dirty, you have to run the load again and it is not obvious that you are blocking anything because you can’t see what happens with the utensils when the door closes. (Just don’t put tall items in the left side of the rack.) And lastly, after only two years, the rack has warped and the newer, flimsier design makes it very difficult to hook the rack to the bottom drawer (we hook it to the drawer for several of the reasons above.) I actually found this site while looking for a fix to the warped rack problem. So although this feature is nice, it creates compromises that probably balance out the benefits. A removable rack in or (better) attached to the drawer is probably just as effective. Thanks for your pictures,,I just bought a home with this dishwasher. They had taken off the utensil racks blue latch and I had no idea how to reinstall it until I saw your pic! Also now I know it can go on the door or bottom rack! Thank You , couldn’t find this anywhere on line, and to think you wrote this 6 years ago. This design is a total fail for me. Regarding mounting the utensil tray on the door, I agree with the negative critiques above, especially that you have to close the drawer to access the utensil tray. When I’m cleaning up, I rinse dishes and utensils at the same time not: all dishes, then all utensils. As for mounting the utensil tray on the drawer, I also found the mounting pins and brackets to be flimsy and easy to accidentally knock the tray off — I ended up fastening it on with zip ties. Plus, the tray’s knife-cleaning feature creates gaps in the internal dividers that catch onto cutlery and make it all to easy to accidentally lift the tray, dislodging it from the drawer. And don’t get me started on the top-drawer design with rows of different sizes, so that slightly larger mugs or glasses won’t fit into half of the rows. I know there are a lot of little fixes for these problems, but good design follows the principle of versatility, thereby offering the user various ways to use the device, rather than dictating one way to use it. I hate hate hate this utensil tray and I’ll tell you why. The bottom of it is angled for no good reason. When I take it out and set it on my counter to unload it, 90% of the time it falls over and half of the utensils fall out onto the floor and have to be rewashed. I’ve seen the same dishwasher interior remanufactured from other vendors (like Kenmore for example) where it’s almost the same tray but the bottom is squared off allowing it to sit sturdy on the counter. Thank you, Thank you, Thank you! I hated the silverware tray on the door, because periodically it would unlatch and the silverware would fall all over. After reading about putting it on the front of the basket I have now moved my silverware tray. You have saved me much cussing and frustration. Add me to the group who has had this brand dishwasher for nearly/over 10 years and didn’t know the utensil basket could hang on the lower basket. I knew it could be moved to sit anywhere in the lower basket, but ….. Oh, well. Just moved it onto the lower basket to give it a trial for loading and cleaning quality. And I shared this blog in answering a question about oversize utensils fitting in my dishwasher’s utensil basket. Thank you. To Jack T and several others who complain about the door-mount cutlery basket, note that the ‘total fail’ is your own. This unit can mount 1) in the door, 2) on the front of the lower rack, AND (wait for it) 3) in a traditional in-rack position on the right side INSIDE the lower rack! This is why it’s called the “anywhere basket”. Thank you., thank you .. wish I had paid more attention to the instructions, I find the basket very frustrating because it often becomes unlatched and silver fall all over. I’m giving it a try hanging on the front of the bottom drawer and also using the separators. I’ll also try placing it in the bottom drawer. Thank you.. wish I had paid more attention to the instructions, I find the basket very frustrating because it often becomes unlatched and silver fall all over. I’m giving it a try hanging on the front of the bottom drawer and also using the separators. I’ll also try placing it in the bottom drawer. My last dishwasher, Whirlpool, and my current dishwasher, Amama, had/have door mount type silverware baskets, which I have loved. I’m upgrading to stainless steel and want to get Kitchenaid, like the rest of my appliances, but it doesn’t look like they offer the door mount basket. I’m trying to decide between getting another brand with door mount or having all my appliances match, but no door mount. Will the other kind drive me crazy and regret not getting door mount? Aghh decisions and first world problems. Advice anyone? Wonderful post and comments. I have been frustrated with the basket and now I at least have a variety of options and ideas. Mine was mounted on the rack and fell frequently. LOL – I didn’t know it hooked on the front ofn the rack! Still trying to figure out why the front opens though!!! Thank you for showing me that this mounts on the front of the bottom drawer! Our little blue knob in the middle broke off and is now missing. So it pops open at inconvenient times. Now I can put it upright and I think that will help a lot! Also wanted to note that I was online looking for a replacement basket when I came acrossed this blog! So this saved me between $20-$50! Yippee! I find the cutlery tray to thin and high, it is hard to get the cutlery in and out without removing the entire wrack. I am using a cutlery holder from my old dishwasher in place of the one that came with the dishwasher. Very disappointing.. Anna.